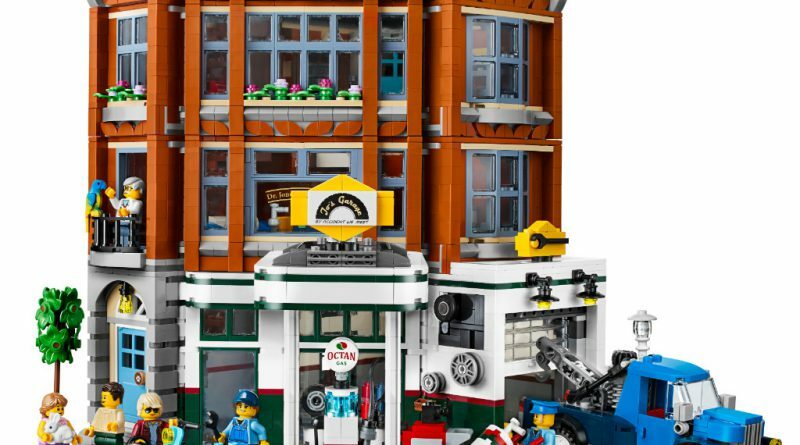 The fan favourite series of modular buildings continues in the LEGO Creator Expert theme, with 10264 Corner Garage announced for release on January 1. A new corner building that comprises of a gas station, garage, veterinarian surgery and apartment will be the next model to be added to the ever expanding street. Since the very first release with 10182 Cafe Corner, the modular series has proven wildly popular with fans – and for good reason. 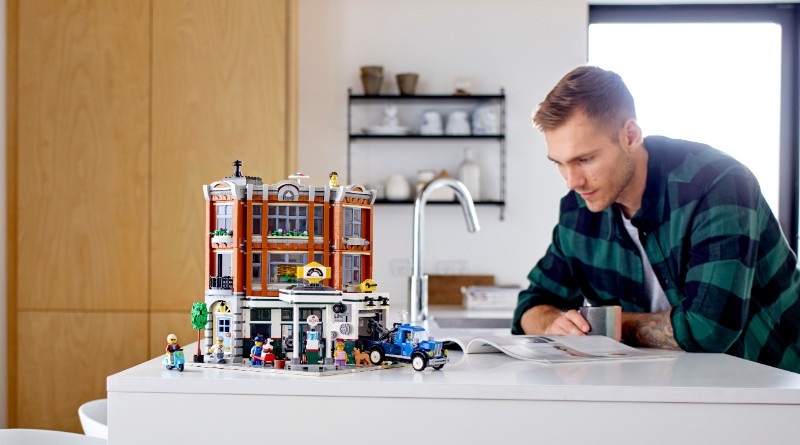 These builds breathe life into an ever growing community, all working together to make a whole, while also maintaining an individual personality. 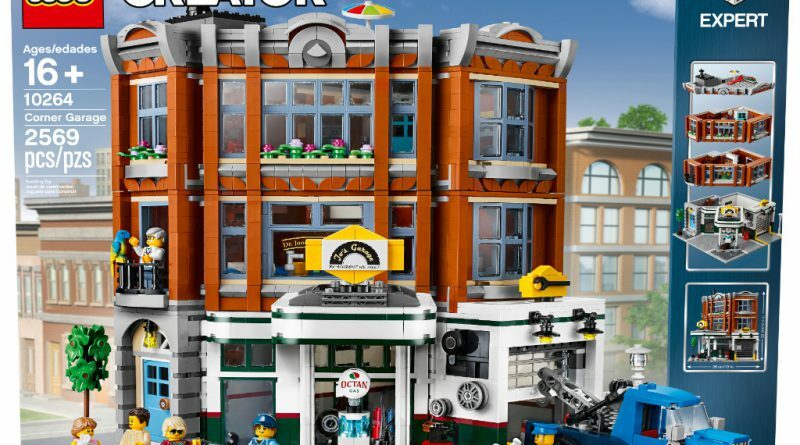 With only these initial images to go by, I’m not at all hesitant in saying that 10264 Corner Garage looks to be one of my very favourites. I love the inclusion of a gas station – not only for its necessity in any town, but also for bringing with it a true cut corner, with the whole building feeling like it’s at an angle. The return of dark orange is a very welcome choice, and its combination with sand blue looks fantastic. It’s colorful without being garish. As with its building brethren, this set sports some great graphic design elements. They are lovely to look at, funny, add to the overall look without distracting from the great build techniques. Speaking of – there are so many things to love about this construction. Much of the walls are built sideways, and the classic mid-century decorative details are simple yet elegant. The tree using the newer leaf parts is also stunningly effective. I can’t wait to get my hands on this beauty. Oh. My. Goodness. The LEGO Group has hit it out of the park again. Last year’s 10260 Downtown Diner was great, but this is perfection. Antique Octan branding, a corner modular that can have a car driven through it, nerd jokes on the window, all contained within gorgeous architecture. Incredible. 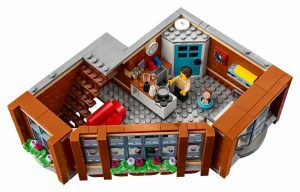 Gas stations have always been a particular soft spot of mine within the LEGO portfolio, so the chance to get one in modular form is a dream come true. 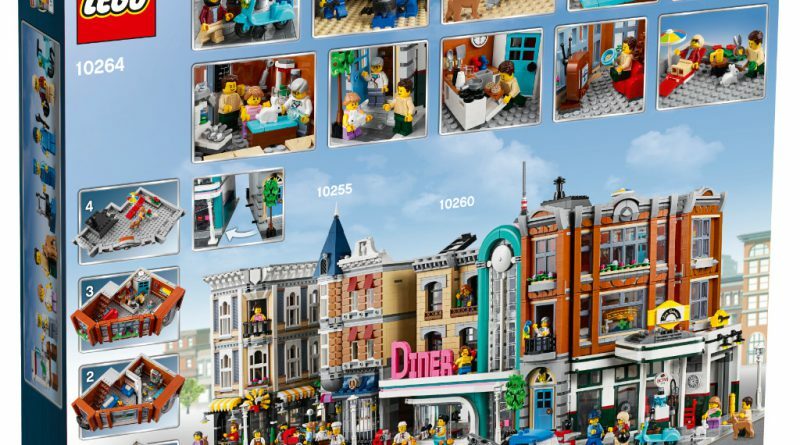 By all appearances this looks to be the third largest modular behind 10224 Town Hall and of course the 10th anniversary 10255 Assembly Square. Aside from size, the other big differentiator which stands out to me is the shape of the building. Due to having to accommodate the garage and driveway, this is one of the least square modular buildings as far as I can tell from the pictures. Building it is sure to be an interesting experience as this looks to be the most novel approach to handling a corner unit yet devised by designers. The modular line has been a bastion of excellence since its inception. This latest entry will continue that tradition. 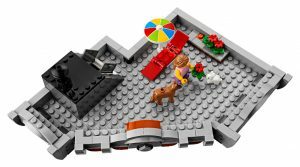 There has been a clear change in style in the LEGO Creator Expert modular series, with the original focus on a European architectural style shifting towards a 1950s American inspired design. This was most clearly demonstrated with the release of 10260 Downtown Diner, and now continues with 10264 Corner Garage. It is a nice change of pace, providing variety in the run of sets that launched over a decade ago. 10264 Corner Garage looks to include some nice touches, including the printed pieces, from a delightful retro style Octan logo to the window adverts. The nicely coloured parrot is bound to prove popular and the scooter is also a welcome inclusion. 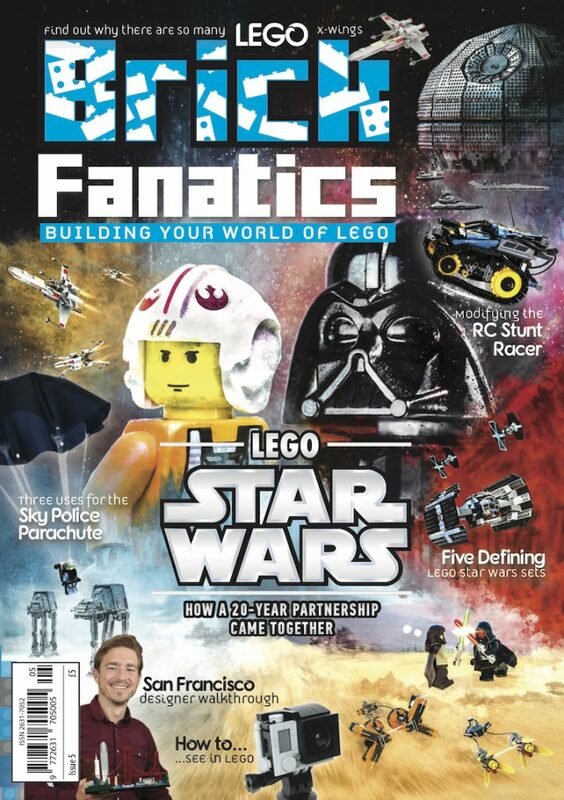 For the second time, modern prints have been used rather than classic smiley minifigure faces, which is a shame. The bottom floor looks to be the most visually appealing, whilst the first and second floor have a slightly blander exterior. 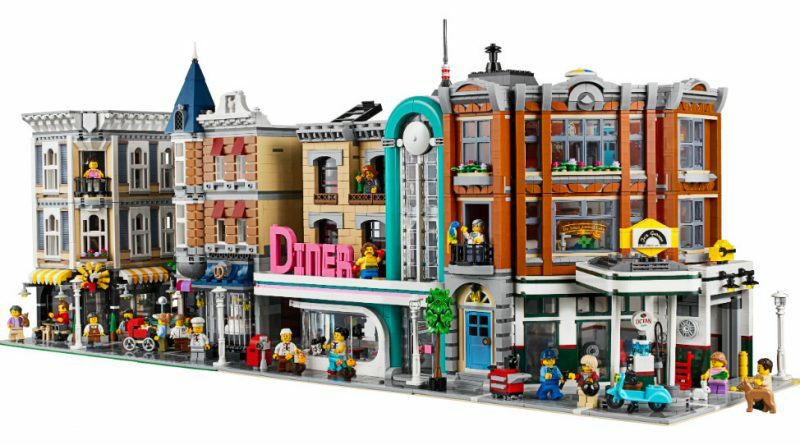 That said, what works about the modular line is that there can be a huge variety of buildings included in it – some will be more ornate than others, which creates more variety when they are all combined. 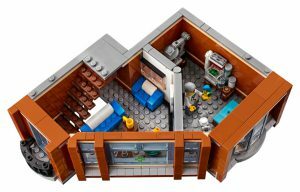 This upcoming set looks like it will make a worthy entry in the series. 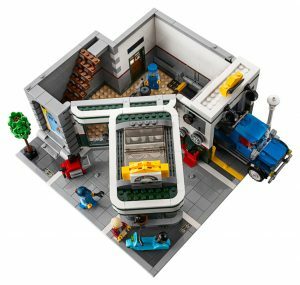 LEGO Creator Expert 10264 Corner Garage will be available from January 1, 2019 exclusively at shop.LEGO.com.